Endive is good, good, and good for you! It’s versatile in the kitchen and chefs use it to dress appetizers, salads and more. Endive is the second growth of the chicory root. This nutritious vegetable was cultivated about 5000 years ago by the Egyptians who used it as a medicinal plant. The Egyptians, as well as the Greeks and Romans who came after them, used chicory as a vegetable and in salads, and believed that it was a liver tonic, a sedative and appetite stimulant. Endive was called the “Friend of the Liver” for its reputed stimulating effect. The different varieties of endive are: Belgian endive which is also known as French endive and has a small cigar-shaped head. It grows in complete darkness to prevent it from turning green. Belgian endive will turn bitter if exposed to light. There is curly endive which is confused with chicory. It has narrow, curly, green leaves. These outer leaves are bitter and look like dandelion leaves. The center is compact and is off-white in colour. Escarole is a wider leaf version of the endive and is not bitter. It is native to the Mediterranean countries. It is thought to have originated in Sicily. Frisee is a miniature version of the curly endive. The outer leaves are a light greenish yellow. The yellow is quite dominant in the middle of the head. Frisee has a mild taste and its leaves are lacy in appearance. Today, endive is universally recognized as a good source of beta-carotene, which the body converts into Vitamin A. Beta-carotene is widely regarded as an effective antioxidant and immune system booster. Endive delivers potassium, calcium and magnesium which are important minerals that help blood pressure and strengthen the heart. 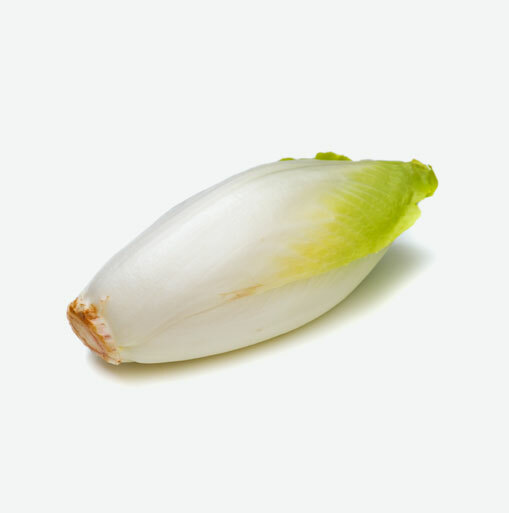 Endive is cholesterol free, sodium free and is very low in calories. Incorporating endive into your diet helps digestion and promotes regularity. Choose endive that is crisp. Check for heads that are firmly packed and are white or pale yellow in colour. When storing endive, wrap the heads in paper towel and then place them in a plastic bag in the crisper drawer of your refrigerator. If you are using the endive raw, you may want to remove the slightly bitterer core from the head. You can do this easily by cutting the endive in half lengthwise and then cutting away the core. If you are cooking the endive, it is not necessary to remove the core, as it will soften and sweeten with cooking. Endive is a versatile vegetable in the kitchen. Wash endive in a bowl of cool water and let the dirt settle at the bottom. Rinse two or three times and trim before cooking or serving. Grill it as a veggie. If using endive in a salad, it is a good idea to add other greens to it to tone down the somewhat bitter flavour. Remember to add a bold vinaigrette dressing and enjoy.